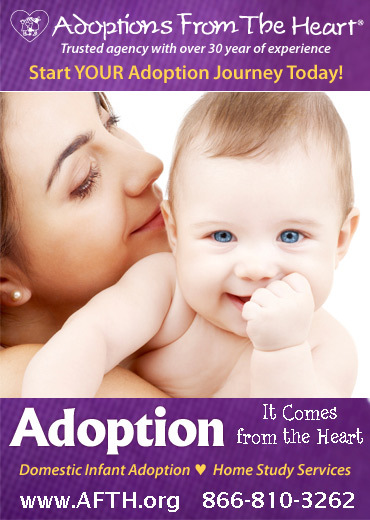 Our family’s experience in becoming part of the world of adoption began in the early 1960’s. At that time, our focus as a young couple, dealing with infertility, was to make a decision about how we were going to deal with the possibility of never hearing the pitter-patter of little feet in our home and our hearts. For us, the decision was easy. If there would not be children by birth, there would be children by adoption. There would be children, that much was clear to us. In those days, the way adoption happened was very different from the way it is today. Choices were few; time involved in the waiting was less. After daunting paper work, medical and psychological testing (that was not different), we received a call and 23 hours notice that a baby was ready to come to our home. Neither of us will ever forget that day. Rushing all over town, we put together a nursery. The next day, we got into our car to bring her home. The miracle that happened is as alive for us today as it was on then. This absolutely beautiful baby was in a box, fashioned like a bassinette, and she was our very own child. Her face, her eyes, every feature of her tiny self was perfect. She looked very different from both of us, in coloring particularly, but difference was of no concern to us, she was an incredible gift. Later, two other children were placed in our family. They are all very grown up Now, and to our surprise, the fact that we all look so different from one another—something that we always thought of in a very positive way—has presented another dimension. It was a reality that our children did not/do not look like us, but we were quite unprepared for the fact that our grandchildren do not look like us either! It is in this process—the lifelong effect of adoption—that each of us who are part of the triad has the opportunity to learn some important things. We learn what the experience is like for each of us—adopted persons, adoptive parents, and birth parents. For us, and especially for me as the mother in this family, two important things happened. In the second generation, I could not share with my daughters the experiences of their pregnancies as I did not share in the experience of the pregnancies that gave them life. And, when their babies were born, the faces of our lineage were not there once again. We had gotten accustomed to our faces not being reflected in our children’s faces. What was new in this next generation of us as an adoptive family was that our grandchildren now looked like their parents —a simple but beautiful joy for us— and they looked like the families of the other grandparents. Not fair. In my heart, I felt that we should have been present in those wonderful baby faces. We had earned a place there because we are the parents of their parents. But we weren’t there. And they all were. The birth families, the in-laws, and our children… the in-laws, that was the hardest part. They were new kids on the block. And they got a front row seat. Please do not accuse me of being irrational. I am talking about gutlevel feelings," real feelings ." I know that our values, our family’s experiences growing up, our heritage, and our families of origin are part of the children. But our faces are not. Our talents, our lack of talents are not. I mentioned earlier that this particular experience was another opportunity to share an understanding of the losses suffered by other members of the triad. Birth mothers of our children were never able to see them grow up and to be a part of their lives. For our children, as adopted persons, they had gotten accustomed to not seeing faces like their own. Each of them dealt with this phenomenon in a different way. That part is their story to tell. Because neither my spouse nor I are adopted persons, we have always had the option to look over our genetic shoulders and put together the pieces of who we are. That is normal for us. And we love the experience of seeing the different characteristics our children exhibited being repeated in their children. The tilt of a head, the size of a foot, the shape of a nose, the artistic ability, the persons of their parents and their parents’ parents are in these little children. One day, one of our children, while standing in front of a picture of my huge Italian family, whose faces mirror mine, said to me, "but, Mom, don’t you see that my face isn’t there…" I hated the pain in that moment. Another day, we sat and looked through an album given to our child, after a reunion with the birth family, and, guess what? My face wasn’t in those pictures! I hated the pain in that moment also. Our grandchildren, like their parents, share in the experience of our family’s life. It is all there, and, most of the time, we are all busy with the business of what we do with our days. Then, every once in awhile, I am reminded of what cannot be changed, what is real and irrevocable in our existence. I am sad for what is missing because I would love to share our genetic lineage with our children. And I am grateful for these incredible children and grandchildren and the gift of parenthood and grandparenthood.